Do infants really need toys? Sure they do! Interacting with toys, even if it is just looking at them, is an important to your infant's development. Your baby spends her first few weeks of life adjusting to the bright, new, and sometimes loud world around her. Studying, focusing, and interacting with toys can help your baby develop and explore her new world. An infant's age often determines the type of toys she'll enjoy. Most toys are labeled with age recommendations, and you will want to stick to those age ranges, especially when your infant is younger. Mobiles, such as the Baby Einstein Sea Dreams Mobile, which attach to the crib, play soft music or ocean sounds and have colorful lights. 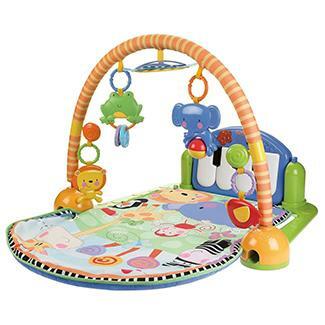 Tummy time mats like the Fisher-Price Discover and Grow Kick and Play Piano Gym, which has a toy bar, colorful pictures on a mat and a piano for baby's feet to kick. Mirrors, including the Sassy Crib and Floor Mirror which stands up on its own. Books with large pictures, such as Black on White by Tana Hoban, which features black and white pictures that are easy for babies to focus on. Rattles and other soft toys that hang from a car seat, bouncy seat or toy bar like the Tiny Love Tiny Smart Rattle that has a hook to easily attach to a car seat handle. Wrist and ankle rattles like the Lamaze Wrist Rattles and Foot Finders that include cute and colorful bugs attached to velcro wrist straps and socks. Rattles like the Bright Starts Rattle and Shake Barbell Rattle, which has an easy-to-hold handle and rattles on both ends. 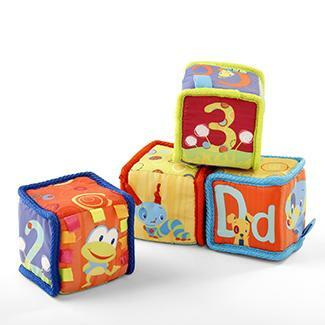 Soft blocks such as Bright Starts Grab and Stack Blocks featuring colorful pictures and the letters of the alphabet. Light-up toys, including the Lights & Sounds Butterfly from Redbox that has four flashing lights and plays a fun tune when baby presses a button. Books with textured pages or fabric books, like Pat the Bunny by Dorothy Kunhardt, a classic touch-and-feel book for babies. Balls that squeak or rattle, like an Oball from Rhino Toys which has holes designed to make it easy for babies to grab. 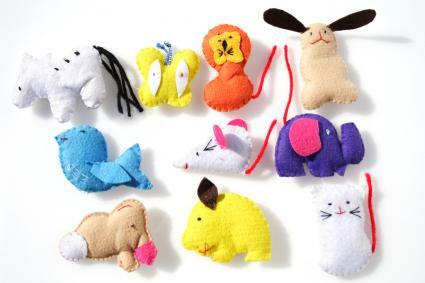 Stuffed animals with lots of parts to pull. For example, Captain Calamari from Lamaze has 8 legs that crinkle, clack and rattle. 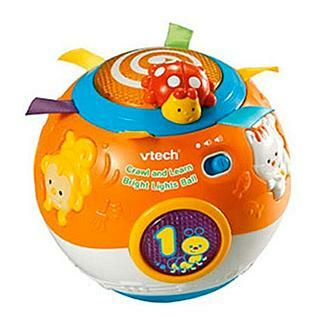 Balls, including the VTech Move & Crawl Ball which moves on its own, encouraging babies to crawl toward the lights and sounds. Pop-up toys, like the Playskool Busy Ball Popper that continually pops up balls for baby to chase. Teething Toys, including one of the most popular teethers, Vulli's Sophie the Giraffe, a cute rubber giraffe that is fun to chew and play with. Cars and Trucks, such as the Sassy Pop and Push Car. All you do is push it down and it runs across the floor while making a popping sound. Activity Centers like an Evenflo Exersaucer, keeping baby contained while allowing him to play, or a Fisher-Price Jumperoo, which lets baby get exercise by jumping around. Nesting cups and stacking rings, such as the Plan Toy Stacking Rings, which are made from organic materials and feature bright colors. If you do not have a lot of money or a lot space, you can also create toys from items you have around your home. Pots and pans make great toys for older babies, especially when accompanied by plastic spoons to bang on them with. Plastic measuring cups and spoons work as rattles and stacking toys. Fill a plastic bottle with coins, beans or beads to make a rattle for the baby, making sure to glue on the cap so a baby cannot remove it and choke on it. You can also roll up a pair of socks to use as a ball. Do not give an infant anything that can fit through a toilet paper tube. It is a choking hazard. Avoid toys with small pieces that could come off and become a choking or strangulation risk. These include beads, buttons, strings, bows, paper tags, small plastic caps and detachable wheels. Avoid toys with sharp pieces or hard edges, magnets or parts that could pinch your infant. Whatever toys you choose, do not just give them to your baby and walk away. Part of the learning experience comes from you playing with the toys along with your baby. Reward your baby with smiles and cheers and she learns to manipulate her toys. Encourage her to grab for new toys and regularly switch out toys to keep her from getting bored. Babies can also become tired or over-stimulated while playing, so you need to be nearby to watch for fussiness and signs of frustration and attend to him when he has had enough.